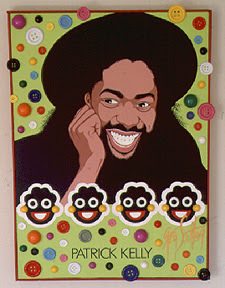 Black History Month marches on, and no tribute would not be complete without including designer Patrick Kelly. Born in Vicksburg, Mississippi, Kelly studied art and black history at Jackson State University before attending Parsons School of Design. 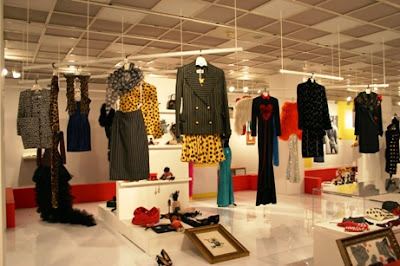 He designed for a Rive Gauche boutique and Benetton before becoming one of the most well-known designers in Paris, showing his collections alongside Sonia Rykiel and Yves Saint Laurent. Kelly made history by becoming the first American designer ever to be elected to the Chambre Syndicale, France’s prestigious organization of designers. His celebrity clients included Grace Jones, Bette Davis, and Isabella Rossellini. Kelly was a bit of a controversial figure, as he used slave imagery on his bags (as shown above), and ended his shows by giving out actual ‘pickaninny’ dolls. Kelly died of Aids on January 1, 1990. His work was put on display, as shown above, in Brooklyn’s Museum of Art in September 2004. His clothes were funky, heavily ornamented, and bright. A flute of champagne to the memory of Patrick Kelly. *If you are in New York during New York Fashion Week, be sure to save the date for Harlem Fashion Week’s 6th annual show on Saturday, February 16th! The event goes down from 6:30-10:30pm at the Museum of the City of New York located at 1220 Fifth Avenue New York, NY 10029. NYFW Event Alert: Fashion Night Out Saturday February 9th + Harlem Fashion Week on Saturday, February 16th!